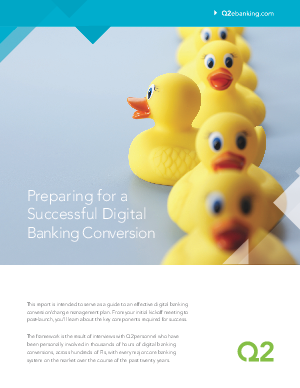 This report is intended to serve as a guide to an effective digital banking conversion/change management plan. From your initial kickoff meeting to post-launch, you’ll learn about the key components required for success. The framework is the result of interviews with Q2 personnel who have been personally involved in thousands of hours of digital banking conversions, across hundreds of FIs, with every major core banking system on the market over the course of the past twenty years.